Vinegar and water can be important parts of a weight-loss diet, but they should not be your only source of sustenance for any longer than a day or two. Any diet that advises you to fast, to eat only one food or to cut out entire food groups is considered a fad diet and not a healthy way to lose weight and keep it off. Lose weight successfully by drinking plenty of water, using vinegar as a low-calorie condiment, getting enough calories from healthy foods and exercising regularly. Drinking plenty of water can be your secret weight-loss weapon. Water is calorie-free and fills up your belly, which can help you eat less. In a study by scientists at the American Chemical Society, adults following a calorie-restricted weight-loss diet were divided into two groups. One group drank 2 cups of water before each meal of the day, and the other group did not. At the end of the 12-week study, whose findings were presented at the 240th National Meeting of the American Chemical Society, the group that drank water before a meal lost 4.5 pounds more than the group that didn't drink water. 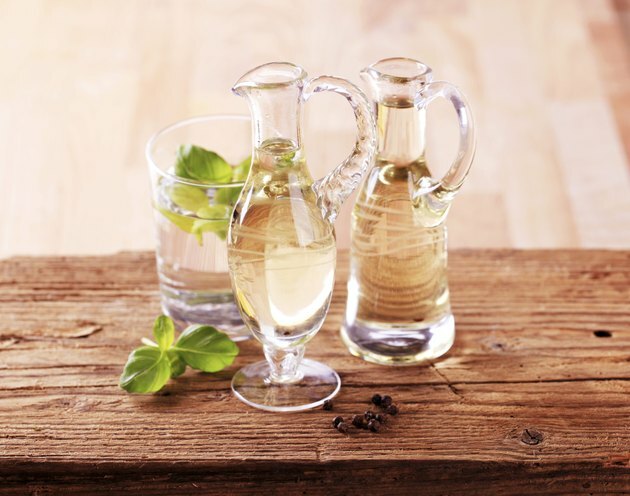 You may have heard a rumor floating around that drinking vinegar will help you lose weight -- but a rumor is all it is. There's no scientific evidence to prove that's true, and drinking a lot of vinegar will likely leave you feeling sick to your stomach. But vinegar can play a role in weight loss when you use it to flavor your foods instead of higher-calorie condiments. Take salad dressing, for example, which is often loaded with fat and sugar. Two tablespoons of ranch dressing has 126 calories, while 2 tablespoons of cider vinegar has only 6 calories. Dress your lunchtime salad with vinegar instead of ranch for a week, and you could save 840 calories. Over a month, that one small change can save you enough calories to lose almost 1 pound of fat. A diet comprising only water and vinegar is categorically unhealthy; however, emerging research says that this type of fasting diet may be useful if followed intermittently. In a study published in May 2012 in "Cell Metabolism," researchers from the Salk Institute fed two groups of mice high-fat diets. The first group was allowed to eat throughout the day, while the second group was restricted to eating only during eight hours per day, which meant they fasted for 16 hours per day. After 100 days, the free-feeding mice had gained weight, while the restricted-feeding mice weighed 28 percent less. This type of eating schedule goes against guidelines for good nutrition, so discuss intermittent fasting with your doctor before you try it out. Consuming only vinegar and water and not getting enough calories carry some pretty hefty risks. Water supplies no nutrients, and cider vinegar provides only traces -- not enough to give your body the nutrients it needs for healthy functioning. Symptoms of nutritional deficiencies include fatigue, loss of taste, intolerance to cold, muscle wasting, discoloration of the skin, rashes, mouth sores, hair loss, vision problems, numbness and depression. A healthier way to lose weight is to eat plenty of fresh fruits and vegetables and smaller amounts of lean protein, whole grains and nonfat diary. Cut out processed foods and sweets and get regular exercise including cardio and strength training.